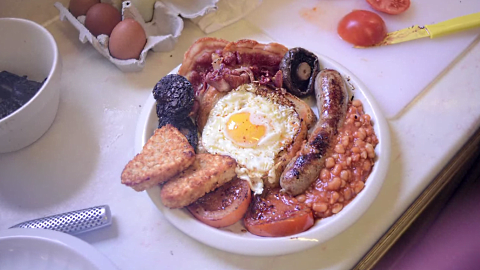 The Fry Up Police is a Facebook forum dedicated to deconstructing that most important British breakfast (and hangover) institution. If you’re from a major pizza hub like NYC or Chicago, you know your city takes pie seriously. That’s almost how seriously British people take the concept of the fry-up. You’re sadly mistaken if you think “fry-up” is what the Brits call a simple breakfast. For the unfamiliar, the British fry-up got its start as the full English breakfast, and is a hallowed British tradition dating back to Victorian times. The English Breakfast Society has a full history here, and like any food that’s the pride of an entire country, there is considerable debate about how to do it right. English people’s love for the fry-up runs deep, and so, London-based Burger Gang tread cautiously when posting its own fry-up on Facebook rating forum The Fry Up Police. Is The Fry-Up Really That Serious? The Fry Up Police final verdict was mostly positive, and even said that, with a little more effort, Burger Gang could have a Hall-of-Fame breakfast plate on their hands. Not bad for a first attempt, but we don’t know if they’ll be willing to go through that homemade sausage struggle situation again.